EU wheat futures closed mostly higher Friday with Paris November milling wheat ending up EUR0.50 at EUR135.50/tonne, and London November feed wheat ending up GBP0.25 at GBP103.00/tonne. The market followed US wheat higher, supported by Egypt buying 240,000 MT of French wheat in a tender Thursday. Russian wheat was snubbed, and news that Egyptian buyers had been forced to re-export a quantity of substandard Australian/Ukraine wheat also helped the market. It would seem that an un-named Egyptian importer bought a load of old rubbish and tried to pass it off as pukka stuff, once again. GASC appear to be getting tired of this particular ruse, and are stamping their foot down. Therefore if you want decent stuff, then you have to pay the price, or you can always buy FSU feed wheat dressed up as milling grade at a discount. Wet weather continues to hamper harvest preogress in the UK, northern France and Germany. September corn ended up 7 1/4 cents at $3.39 1/2 per bushel, and December corn ended up 7 1/4 cents at $3.49 1/2. Weekly corn exports for 2009/10 reported yesterday were a marketing year high of 1,480,700 MT, up 61% from the previous week and 65% from the prior 4 week average. Although US weather remains favourable for promising crop development, exports are running at a very strong pace. Sep corn gained 23 1/4 cents on the week, ending a string of seven consecutive weekly losses. August soybeans ended 5 3/4 cents higher at $11.34 a bushel, and November soybeans finished 11 cents higher at $9.82. Soybeans finished the day and the week on higher prices, closing $1.13 higher than last Friday. Good export sales and continued Chinese buying of soybeans this week were the basis for much of the price increase. Good weather for soybean development will continue over the next five days. September wheat closed at $5.28 ¼, up 12 cents. Wheat had good export sales for the week and for the month so far. Export sales as of July 30th will be released next Thursday. Weather conditions for spring wheat development in North Dakota and harvest in South Dakota over the next two weeks are forecasted to be ideal with normal temps and rainfall. Month-end positioning on a heavily short market also helped prices today. IKAR yesterday pegged Russian grain production for this season at 92 MMT, 15% down on last season despite an increase in planted area. According to the Russian Agriculture Ministry the harvest this season so far amounts to 32 MMT, off 23.6% of the planted area. Yields to date are 2.83 MT/hectare down 0.82 MT/ha or 22.5% on last year. The Ministry peg this season's grain output at only 85 MMT, down more than 21% on last year's 108.1 MMT. In the Ukraine harvesting is well advanced with farmers cutting 72% of planted area as of 30th July, producing 26.5 MMT of grain. Wheat harvesting os 79% complete at 16.5 MMT, with yields averaging just over 3 MT/heactare, compared to 3.5 MT/ha last season. According to the forecasts of the Ministry of Agriculture of Kazakhstan, this year's wheat crop will increase by around 1.5-2 MMT on last season to 13-14 MMT in net weight "if there is good weather in August and if we harvest the crop on time." "The exact forecast will be in the middle of August," the Ministry said. It looks like my current estimate for Russian wheat output at 59 MMT this season is towards the top end of analyst's estimates, Ukraine production at 19 MMT is probably now a little on the low side, and Kazakhstan output at 14 MMT spot on. Even so Russian and Ukraine wheat output is probably down around 5 MMT each this season. The landlocked Kazakh's will be looking to capitalise on this lower output from it's near neighbours to steal a few Black Sea export homes for itself. EU wheat futures had a rare higher close Thursday with November Paris milling wheat ending EUR1.25 higher at EUR135/tonne, and London November feed wheat closing GBP1.50 higher at GBP102.75/tonne. Strength came from sharply higher US markets, although CBOT wheat was (as usual) the weakest of the complex. Egypt bought 295,000 MT of wheat in a tender, with all but 55,000 MT of that French wheat - the rest being US material. It was interesting to see them pass on Russian wheat, having favoured that particular supply-route in their last tender. It seems that offers of Russian grain were scant, after the recent problems concerning quality issues from that country of origin. International shippers still seem quite reluctant to put up offers of Russian wheat despite both countries protestations that the problems are sorted. Harvest pressure still remains however, and it certainly seems far from likely that we can call this anything but a temporary correction in a long-term downtrend. A weak dollar is bearish for UK and French wheat, and the IGC upped it's global 2009 crop estimate by 2 MMT today to 654 MMT. August soybeans closed 70 3/4 cents higher at $11.28 1/4 a bushel, and November finished 55 cents higher at $9.71. Larger than expected weekly net export sales for soybeans and soymeal at nearly 955,000 MT and 408,000 MT respectively, plus an additional confirmed sale of almost 2 MMT of soybeans to China set the market on fire from the off. Although the sale was mostly new crop, it did include 120,000 MT of old crop beans. This seems to have got the market thinking, exactly what is China up to attempting to auction off some of it's soybean reserves, whist domestic crushers continue to fill their boots with cheaper US beans. Firmer crude oil and equities and a weak dollar were also supportive. September corn ended up 11 1/2 cents to $3.32 1/4 a bushel, and December corn ended up 14 1/4 cents at $3.42 1/4. Larger than expected weekly export sales for corn of more than 1.25 MMT were reported by the USDA lending support to futures. Outside markets also helped, with a weak dollar and firmer crude, stocks and metals also adding support. Funds bought an estimated 6,000 contracts on the day, despite US weather remaining non-threatening. Spillover strength from beans also helped futures higher. September wheat ended 4 3/4 cents higher at $5.16 1/4 a bushel. Spillover strength from corn and beans helped wheat, as too did the firmer outside markets and a weak dollar. Better than expected weekly net export sales of wheat at nearly 575,000 MT didn't do any harm either. Egypt bought a ruck of mostly French wheat today, but at least it passed on Russian tenders and picked up a 55,000 MT cargo of US wheat into the bargain. Japan was also in the market, picking up 144,000 MT of mostly US wheat. Russian grain production this season is pegged at 92 MMT, according to the Agrarian Market Conjuncture Institute (IKAR). "In spring, we were expecting this year's grain harvest to be up to 97 MMT. We have reduced that forecast to 92 MMT. The main reason for lowering the forecast is drought," they say. The figure co-incides quite nicely with SovEcon's latest estimate for a harvest of 90-95 MMT. Production of 92 MMT would represent a drop of around 15% on last year. Despite lower output this year, Russia will likely remain an aggressive exporter for the forseeable future. IKAR estimates reserves of last year's grain to be around 18 MMT. EU wheat futures closed lower again, with London maintaining a seemingly unstoppable march back into double figures for the first time this year. Paris November milling wheat closed down EUR1.75 at EUR133.75/tonne, and London November feed wheat closed down GBP1.25 at GBP101.25/tonne. Harvest pressure continues to hammer the market lower. 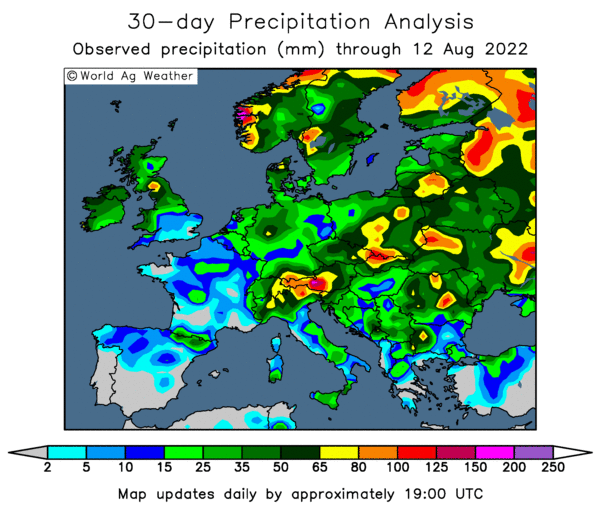 Late season rains across northern France, Germany and the UK may have caused some quality losses, although yields seem unlikely to have been affected. 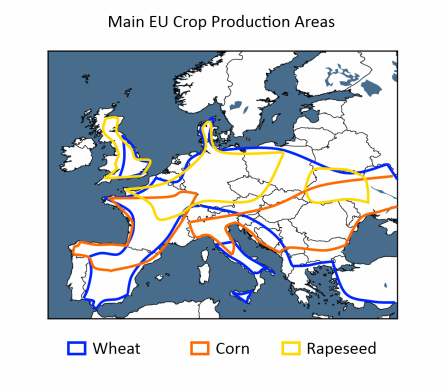 Early reports on rapeseed harvested in France and Germany are showing better than expected yields. August soybeans closed at $10.57 ½, up 3 cents, November at $9.16, up 11 cents. Soybeans were lower most of the day and then rallied towards the end of the trading day to close higher on the old crop and lower on the new crop but a dime off the daily lows in November soybeans. Estimates for tomorrow’s weekly export sales report are between 300,000 and 500,000 MT. China continues to attempt to auction off some of it's soybean reserves, so far without success, although this week's auction prices is a little lower than last week's. expect the Chinese to auction 2 MMT of reserve soybeans by the end of September. Estimates for tomorrow’s weekly export sales report are between 300,000 and 500,000 MT. September corn closed at $3.20 3/4, up ¼ cent, December at $3.28 down, 1 ¾ cents. Small amounts of rain are forecast for the central and eastern grain belt from today to August 3rd along with the Gulf side of Texas. The Southeastern quarter of the US is looking for amounts of 1 to 4 inches with most of the precipitation falling in Arkansas and Mississippi. Recent weather conditions have been optimal for most of the corn producing areas during the pollination period. Tomorrow’s estimates for the USDA weekly export sales report range between 850,000 and 1,200,000 MT. Crude oil pushed to much lower values on a larger than expected stock increase of 5.1 million barrels. September wheat finished at $5.11 ½, down 4 ¾ cents. Wheat prices finished lower recovering some of the earlier day losses. Below normal temperatures and precipitation are forecast for the Spring wheat areas of Montana, North and South Dakota and Minnesota from now until August 4th. Weather is seen as being largely beneficial for spring wheat development. Recent data from spring wheat crop scouts are showing signs of good yields in the areas surveyed so far. Trade guesses for tomorrow’s weekly export sales report are from 350,000 to 450,000 MT. EU wheat futures closed mixed Tuesday with November Paris milling wheat ending up EUR0.25 at EUR135.50/tonne and London November feed wheat closing down GBP0.85 at GBP102.50/tonne. Weather concerns continue to weigh on feed wheat relative to milling wheat. Heavy rains are falling across much of the UK, bringing back uncomfortable memories of last year. Although the harvest ultimately got in in 2008, quality was badly affected by persistent rains during the crucial July/Augist period. 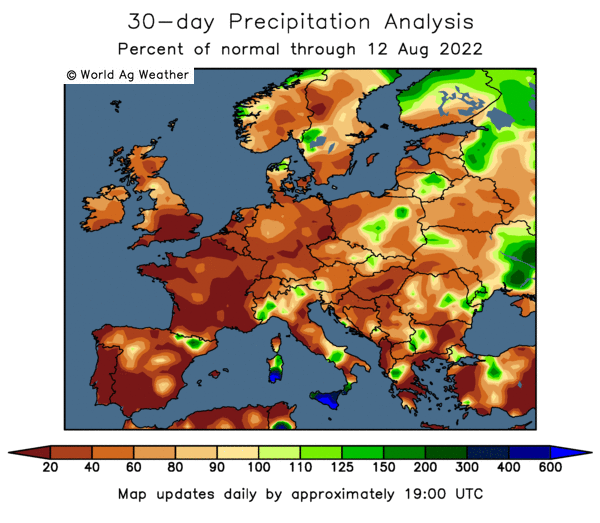 Rain also remains a problem in northern France and Germany. Export interest is still sluggish for EU wheat, and Russia contnues to pick up most of the orders that are going. It seems that the only way is lower. EU wheat futures extended their recent steep decline Monday, with November Paris milling wheat closing down EUR2.50 at EUR135.50/tonne. London November feed wheat closed down GBP2.95 at GBP103.05/tonne. 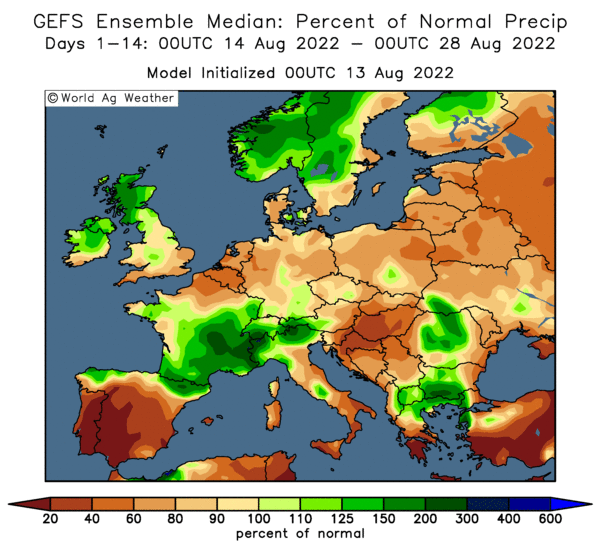 Harvest pressure continues to weigh on the market, although widespread rains in northern Europe seem to have pushed the harvest back a couple of weeks. The same rains are causing quality concerns, which explains why feed wheat in London was lower than milling wheat in Paris. Whilst farmers are generally reluctant sellers at these levels, the continued decline, with no apparent respite in sight, is a cause of some concern. The pound's apparent new-found strength was also bearish for UK wheat. EU rapeseed futures also closed sharply lower, with November Paris down EUR8.00 at EUR259.50/tonne, on talk of better than expected yields in France and Germany. September corn closed at $3.22 ¼, up 6 cents. The crop progress report out after the close, showed 55% of the corn crop silking, up from 31% last week but well behind the five year average of 76%. NASS reported 7% of the corn in the dough stage, the same as last year and behind the five year average of 17%. Crop ratings were 8% poor to very poor and 70% good to excellent. Ratings slipped 1 point from the good to excellent into the poor to very poor. August soybeans closed at $10.21 ¼, up ¼ cent, November at $9.06 ½, down 8 ½ cents. Weekly crop condition ratings released after the closed showed 63% of the crop blooming, ahead of last years 60% but behind the five year average of 76%. Pod setting is at 20%, 1 % better than last year but behind the five year average of 36% because of later planting dates. Soybean ratings did not change from last week with 8% in the poor to very poor and 67% in the good to excellent category. September wheat ended at $5.20 ½, up 4 ¼ cents. The USDA weekly Crop Progress report showed Spring wheat is 93% headed compared to 98% last year and for the five year average. Winter wheat is 79% harvested, on target with last year and behind the five year average of 84%. Spring wheat crop condition ratings were at 7% poor to very poor, the same as last week. Good to excellent is 74% improved 1% from last weeks 73%. 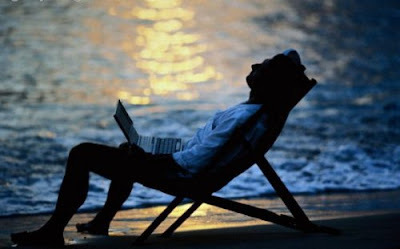 I might be on holiday but, the blog will still be getting updated, just not with the same frequency, and the futures prices etc on the widget should still work too. 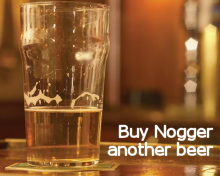 Rub it in a bit lower please Mrs Nogger, up a bit, down a bit, up a bit, down a bit. Ahhhhh. No I won't do you, you lazy cow, you can sort yourself out. My touchpad will get all messy.